Five Finger Death Punch producer Kevin Churko has commented on the lawsuit filed last month against the band by their record label. He said: "As a record producer, I've always remained behind the scenes. I feel very grateful that I get to sit in my air-conditioned studio with a cold drink in my hand and then actually get paid to make music. It's a wonderful job. But nobody in the music industry has any job without the artist. This is especially true of Five Finger Death Punch, a band whose music and career I am especially proud to have contributed to and to have had them contribute to my career. I was confused, concerned and disappointed to learn that the band has been sued by their record company, Prospect Park, LLC. Moreover, because my name was mentioned in the lawsuit, I thought I should go on the record with some facts. 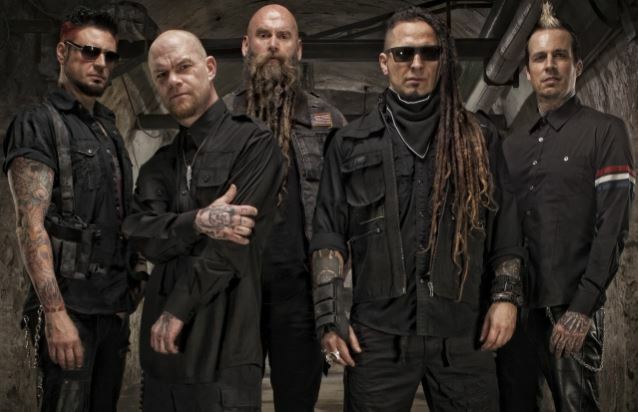 Five Finger Death Punch and their management have always said that they couldn't commence recording until June 5th of this year and that they couldn't deliver the album until September 5th. That has always been their intention, and that's what I agreed to do. Prospect Park claims that if Five Finger Death Punch were to hire a different producer, they could sell well over a million records, maybe even two million. We all aim for the highest of goals, but honestly, there hasn't been a record in the hard rock genre that has achieved anywhere close to those sales in a two-year period of time. I have worked with several of the biggest and am appreciative my bands are doing so incredibly well. With 5FDP, I have the privilege of working with gifted and prolific songwriters (Ivan, Zoltan, Jason, and Jeremy) whose singer, Ivan Moody, has a truly special and distinctive voice. Not only have they sold over 4 million records at a time when general album sales are diminishing, 5FDP have created a solid brand and raised thousands of dollars for veteran charities. I wish Prospect Park and Jeff Kwatinetz wouldn't have dragged my name into this. However, I feel a moral obligation to go on the record and protect Five Finger Death Punch's name and mine. Moreover, I am scratching my head as to why Jeff Kwatinetz would want to get involved in the creative of this band after 5 albums together when every record I've ever recorded for 5FDP has been finished in the studio of which I've never seen him present. I've never met Jeff, never had a conversation with him, not even an email. I've never submitted demos for approval while recording and I've had no direction given to me by Jeff. 5FDP knows who they are and what they're good at. From what I can tell, they're the one consistent, successful band in 10 years with Prospect Park. I'm grateful to have done my part. It's not about the company. It's about the music and the artist. Having worked with many record companies, I found it frustrating that Prospect Park repeatedly did not pay me on time. I feel if it wasn't for the direct efforts of the band members themselves, their management and their business manager, I may still remain unpaid. They were champions for me from the beginning and I'll be a champion for them to the end. Contractually, this would be Five Finger Death Punch's final album for Prospect Park. One can read between those lines."